Nice turn-out tonight. It felt busy. We’re showing 40 entries so far. Even stronger than last year at this point. A lot of the weekly regulars have shown up (though not all! what up), as well as some fresh faces, plus there’s a solid contingent from Seattle, and from British Columbia. And more of them to arrive tomorrow. Action starts tomorrow at noon. And there’s, no doubt, gonna be a lot of shifts in the leaderboard. Ricochet has set up some rad side-games. Get this! They have a Data East Star Trek machine with flippers that you activate using an NES Gun! There are sensors at the bottom of the playfield, and you shoot the gun at the left or right sensors, accordingly. Its really difficult! But I was definitely improving with each try. Whosoever has the high score by the end of the tournament wins half the coin box. 25 cents to play. Plus, they set up Bad Cats Tommy Style – with the bottom foot of the playfield covered up in black tape, so you can’t see the flippers! And – third side-game machine – Time Machine is set with reverse flippers. The right button triggers the left flipper, the left button triggers the right. Super challenging. Top score on any of these machine by the end of the tourney wins half the respective cashbox. They are really fun, unusual, and creative side-games to be running during the tournament. Fun ways to step away from the qualifying machines and just get wild! Sorry, I did not take pictures of anything tonight. I’ll take and post some pics tomorrow. And I’ll also post another status report after the qualifying rounds ends, midnight tomorrow. Good luck tomorrow, everyone. Let’s see some sick scores! Hey hey, next weekend is the second annual Showdown at Slabtown!! It’s a three day tournament, with big cash payouts to those who qualify for the final day’s matches. Check out the Showdown page for more details, plus some stuff about the rules. And read the message board thread for some hot discussions! This style of tournament, though different from Portland’s weekly tournaments and from the Ground Kontrol Pinbrawl, has a strong focus on an individual’s skill and strategy. While you are trying to beat other people’s scores, you’re also allowed the time and space to do your best without having to worry about being eliminated after just a couple bad games. Two days of casual flow qualifying on Friday and Saturday! Hang out, watch the players, watch your placement go up and down, and have fun! But then on Sunday, things change! Once it’s down to 16, you’ll be matched up against the other players, playing three 4-player games, and then advancing (or not) from there. A lot of people will be entering this tournament. 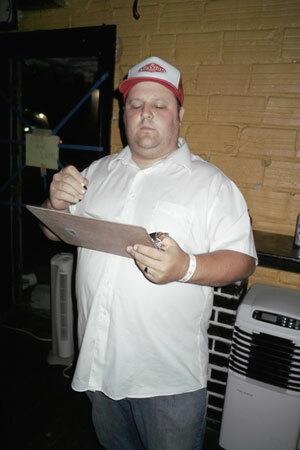 It’s a good way to check out the scene, get sorta serious about your game, TRY HARD, and maybe win some money! Machines are provided by Quality Entertainment, Ricochet Pinball, and some individuals. Thank you to all y’all, and to the organizers, and Slabtown! It should be a lot of fun. 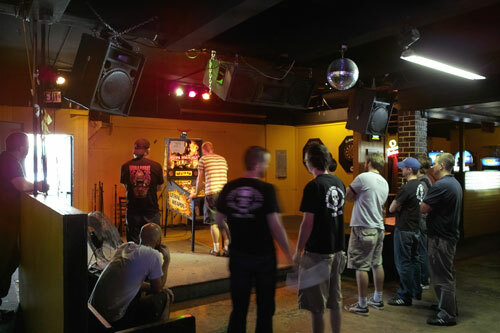 There are two big pinball tournaments in Portland each year, and this is one of them! And like last year, we’ll try to keep this blog up to date with the latest qualifying scores (daily round-up). Single game, double elimination. $5 entry, starts at 7:00pm. Single game double elimination. $5 entry, starts at 7:00pm.